The Dublin Theatre Festival returns to commandeer every stage in sight, the lead of its host of headliners being Conor McPherson’s The Night Alive. Set in the ramshackle squalor of a Dublin flat, The Night Alive is a showcase in tonal evolution. Tommy, a self-described ‘entrepreneur’ and parental figure for the rest of McPherson’s damaged characters, is plagued by a near ludicrous level of discord; a failed marriage, business and dog-biscuit-based diet, all under the spectre of his uncle turned landlord Maurice. Introduce Aimee, blood-soaked and with the aloof, darting stare of someone used to violence, saved by Tommy’s altruism, despite unforeseen consequences. 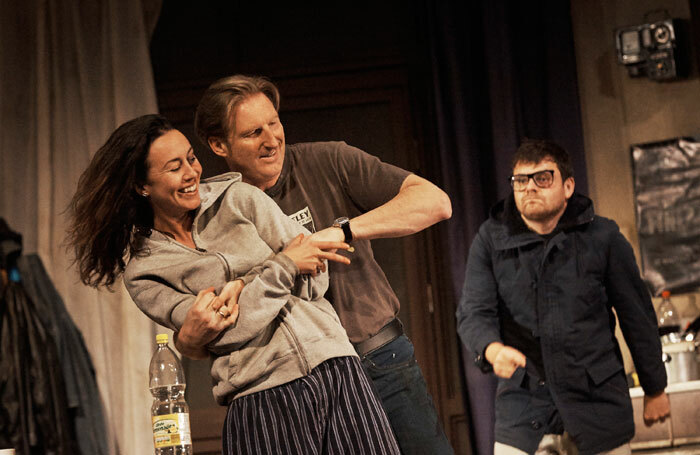 Performed with cathartic joy by Adrian Dunbar as Tommy, the cast walk a fine line in keeping with the script’s emotional fluctuations. Sitcom levels of comedic schtick and musicals are punctuated with sudden sadistic torture, all framed by the high-rise debris of Alyson Cummins’ exquisite set design. Rough Magic’s The Train attempts a musical dramatisation of the 1970s ‘contraceptive train’; the Irish Women’s Liberation Movement’s attempt to transport contraceptives across the northern border in defiance of state and church. 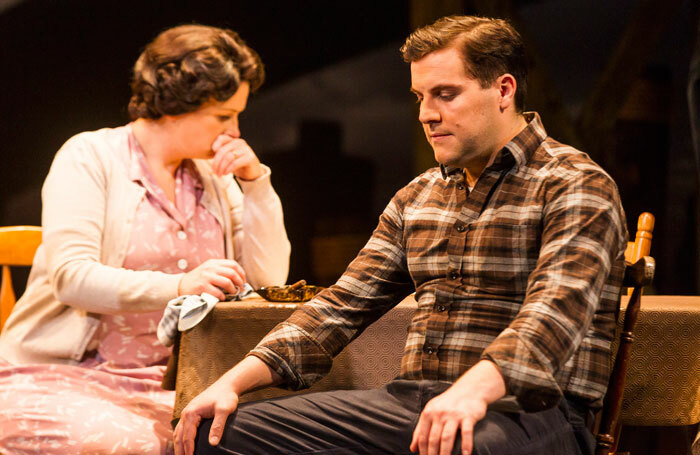 With a stage enclosed in stained-glass filtered light and smoky scaffolding, the enthusiasm and have-a-go musical style of the cast struggle admirably to save the play from its muddled script. The central narrative is plagued with misfit subplots and tropes, first attempting a ‘fallen angels’ approach to the feminist movement, before veering into a modern day Adam and Eve parody that further contrives the play’s ever-shifting messages. Accompanied by a toe-tapping folksy score by Bill Whelan, the cast struggle to raise their vocals above the jaunty instrumentals. 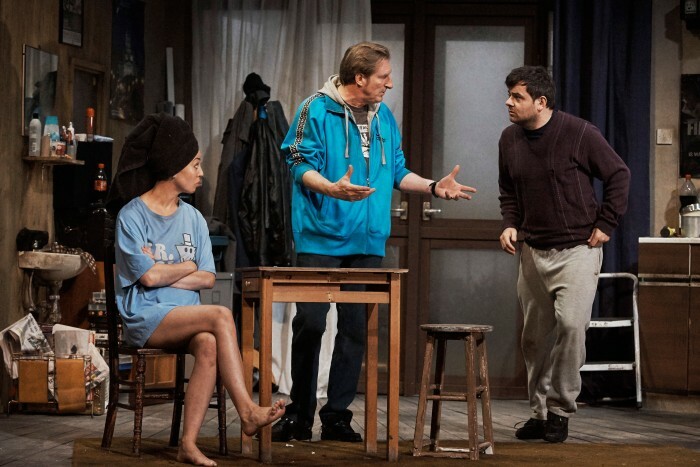 The performances, particularly an incensed Darragh Kelly armed with a priest’s frock and cigarette, hold up a mirror to the cultural stereotypes of 1970s Ireland. But as the sum of its parts, The Train becomes tangled in unnecessary frills and a lack of coherency. 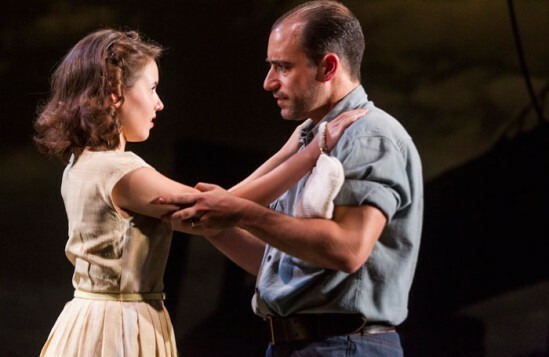 Joe Dowling’s A View From the Bridge brings a cautiously skilful hand to Arthur Miller’s literary milestone. Scott Aiello gives a chilling portrayal of Eddie Carbone, with his antihero tailspin matched by old hands Niamh McCann and Bosco Hogan. Silhouetted against the knotted scaffolding of Beowulf Boritt’s set design, the production achieves its author’s goal – to make the audience squirm their seats. Finally, Wayne Jordan’s trimmed-down Oedipus ventures a modernisation of Sophocle’s epic into a questionable musical. Marble columns and robes give way to a simple wooden table, orbited by rows of chairs and T-shirt-clad cast – Oedipus 2.0 if you will. 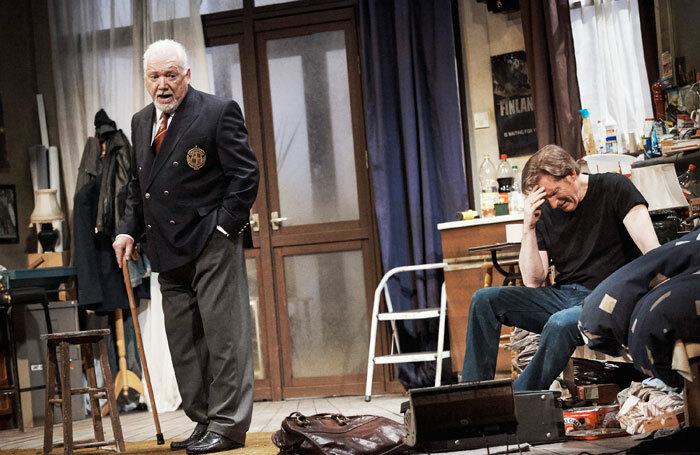 Barry John O’Connor’s performance as Oedipus himself, accompanied by a strident Peter Gowen and Fiona Bell as Tiresias and Jocasta form the redeeming crux of the play’s wobbly execution. Storming between the rows of chairs, tendons taut, O’Connor brings a honed emotional edge to the well-worn role, culminating in a throat-tearing climax that has the King of Thebes broken, blind and groping at the legs of chairs upon his iconic discovery.